In a report released this month by the National Safety Council, which provides research showing just 13 states and Washington, D.C., have implemented comprehensive, proven actions to eliminate opioid overdoses and help protect their residents. Despite widespread acknowledgement of the severity of the opioid crisis, most states have been slow to respond, according to this recent report from the National Safety Council. The 2018 report did not conduct research into states with medical cannabis programs and the impact there on reducing use of opioids and other painkillers but the National Safety Council has plans to do so in the 2019 Prescription Nation Report. Despite this years report not taking medical cannabis programs into consideration, there are some strong correlations revealed in the NSC Prescription Nation White Paper. Only 13 states and the District of Columbia have implemented comprehensive, proven measures to address what NSC calls “the worst drug crisis in recorded U.S. history” in Prescription Nation 2018. The report, which analyzes how states are battling the opioid crisis, has been released annually since 2013. 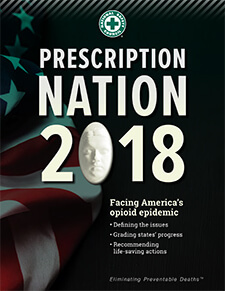 In Prescription Nation, a digest analyzing how states are tackling the worst drug crisis in recorded U.S. history, the Council assigned its highest mark of “Improving” to Arizona, Connecticut, Delaware, Washington, D.C., Georgia, Michigan, Nevada, New Hampshire, New Mexico, North Carolina, Ohio, Rhode Island, Virginia and West Virginia. All of these states, except three; Georgia, North Carolina, and Virginia - the rest are all states with a comprehensive medical cannabis program that allow treatment of ‘chronic pain’ or ‘severe pain’. The eight states receiving a “Failing” mark – Arkansas, Iowa, Kansas, Missouri, Montana, North Dakota, Oregon and Wyoming – are taking just one or two of the six key actions identified in the report as critical and life-saving. All of the states receiving failing grade, except Oregon, are all states with no medical cannabis programs or states that allow use of "low THC, high cannabidiol (CBD)" products for medical reasons in limited situations or as a legal defense. 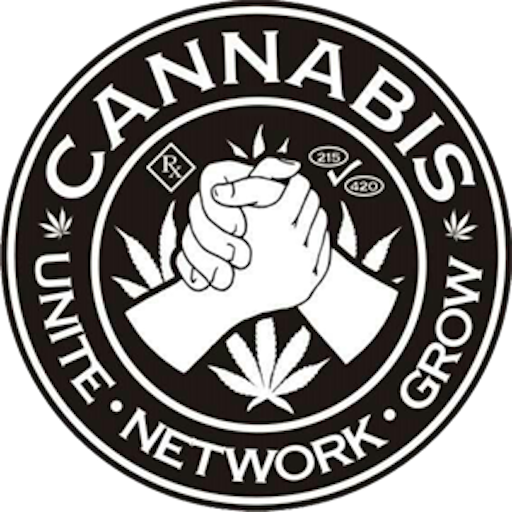 Those programs are not counted as comprehensive medical cannabis programs. 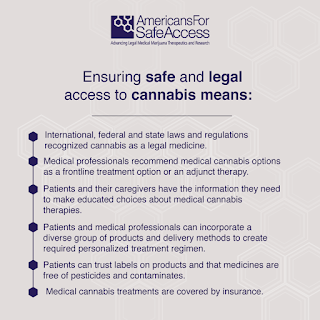 Americans for Safe Access released “Medical Cannabis as a Tool to Combat Pain and the Opioid Crisis: A Blueprint for State Policy.” The blueprint outlines legislative and regulatory solutions related to medical cannabis that states can utilize to combat the opioid epidemic. 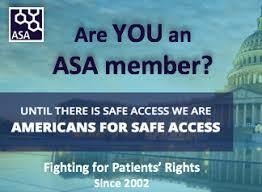 Americans for Safe Access and their advisors have examined current medical cannabis programs and have identified many barriers for medical professionals, patients, and their caregivers that prevents them from utilizing medical cannabis as a tool to combat pain and opioid use disorder. The following report takes a public health approach to defining enrollment issues and offers a blueprint for legislative and regulatory bodies to resolve these issues. We have concluded that improvements in state medical cannabis legislation and regulations could increase program enrollment and save lives. 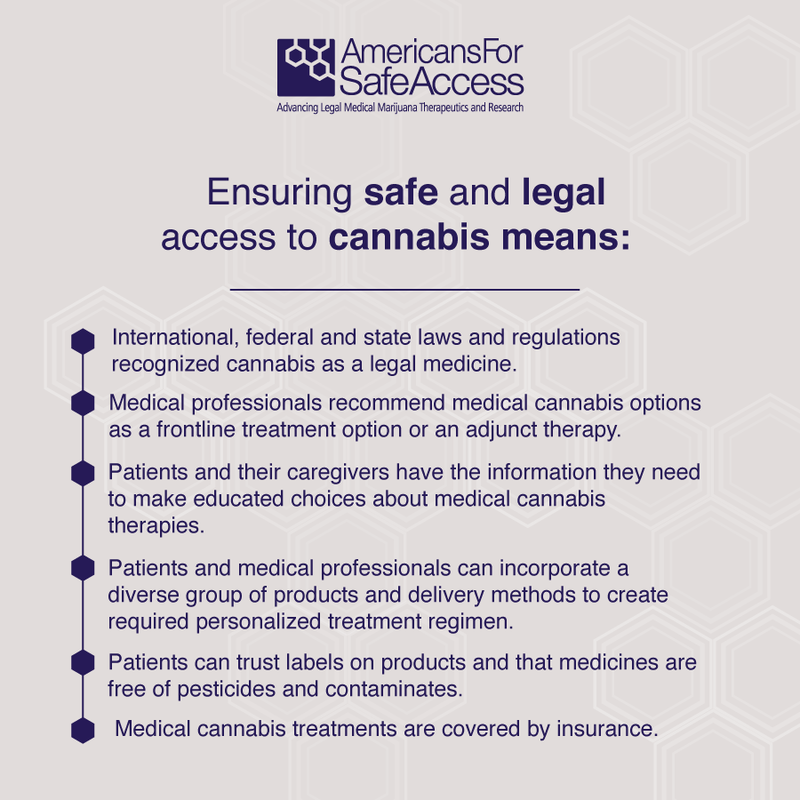 The report features model legislation, an emergency proclamation, and flow charts that help lawmakers identify barriers to access that medical cannabis patients in their states are facing. New Mexico and Nevada are the only two states to meet all six indicators, giving those two states the highest marks in the NSC Prescription Nation White Paper. This is great news for those states and for New Mexico this shows how further expansion of the states medical cannabis program with result in a continued decline in opioid & painkiller drug abuse, overdose, and even death. Despite having a 10 year old comprehensive medical cannabis program and a medical cannabis law on the books for over 40 years- the New Mexico Department of Health mentions nothing of how medical cannabis contributed to the reduction seen in the state. more than 14,400 patients between the end of January 2017 and the end December 2017. Each day, the Medical Cannabis Program receives between 150 and 600 patient applications. Then in the late fall of 2017, we saw a new study conducted by researchers at The University of New Mexico, involving medical cannabis and prescription opioid use among chronic pain patients, found a distinct connection between having the legal ability to use cannabis and significant reductions in opioid use. 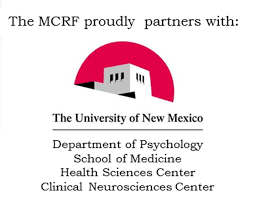 The UNM researchers used Prescription Monitoring Program opioid records over a 21-month observation period (first three months prior to enrollment for the MCP patients) to more objectively measure opioid cessation – defined as the absence of opioid prescriptions activity during the last three months of observation, with use calculated in average daily intravenous [IV] morphine dosages. MCP patient-reported benefits and side effects of using cannabis one year after enrollment were also collected. 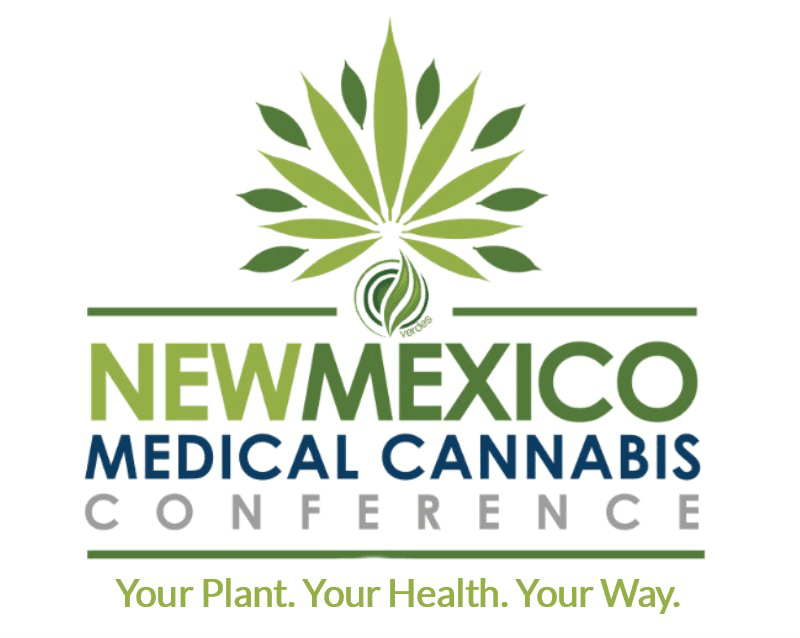 Survey responses in the UNM study indicated improvements in pain reduction, quality of life, social life, activity levels, and concentration, and few negative side effects from using cannabis one year after enrollment in the MCP. 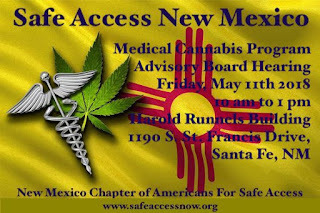 Lawmakers in the Roundhouse and the Governor need to address the neglected medical cannabis program and follow the recommendations by the Doctors on the advisory board. The State’s Medical Cannabis Program expansion is now “Medically Necessary” and the State needs to allow the Department of Health to open the application process, the State needs to increase the Licensed Non Profit Producer plant count, add more licensed non-profit producers, in conjunction with other measures to ensure safe access to medicine.